A young FBI cadet must receive the help of an incarcerated and manipulative cannibal to help catch another serial killer, a madman who skins his victims. 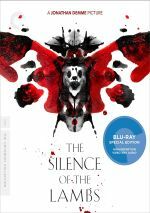 As this Criterion Blu-ray represents my fifth review of 1991’s The Silence of the Lambs, I’ll skip the usual movie discussion. If you’d like to read my more detailed thoughts, please click here. To summarize, The Silence of the Lambs doesn’t provide a perfect movie, but it certainly delivers the goods. Director Jonathan Demme made a film that seems to grow in stature as time passes and it remains a favorite of mine. The Silence of the Lambs appears in an aspect ratio of approximately 1.85:1 on this Blu-ray Disc. Despite the limitations of the source, this became a solid presentation. Sharpness worked fine. Due to the photographic style, some softness occurred, but those elements came from the original property, so the Blu-ray reproduced the imagery as intended. I witnessed no issues with jagged edges or moiré effects, and edge haloes remained absent. We got a good natural layer of grain and the movie lacked any form of print flaws. Not exactly packed with dazzling hues, Lambs opted for a palette that leaned to the brown side of the spectrum. Within those limitations, the colors appeared well-reproduced and full. Blacks seemed dense and dark, while shadows presented smooth, clear tones. Lambs brought a challenging image that the Blu-ray reproduced well. As for the DTS-HD MA 2.0 audio, the front soundstage felt broad and added a lot to the experience. Music and effects consistently spread out across the front speakers, and we also heard some dialogue from the sides. The rear channels remained the junior partner, but they still added to the experience, as they broadened the movie’s sonic horizons. I got a nice feeling of atmosphere from the back speakers, so they contributed a solid sense of environment. Audio quality showed its age but still fared well overall. Speech could be a smidgen reedy but the lines remained easily intelligible and lacked edginess or notable flaws. Howard Shore’s score brought vivid, lively tones, and effects provided nice depth and breadth. These came with warm low-end that contributed to the movie’s feeling of dread. Though I couldn’t call this a killer soundtrack, it suited the movie well. Note that the Criterion package offered an “alternate” DTS-HD MA 5.1 soundtrack. In terms of scope, this mix seemed pretty similar to the original 2.0 version. While the 5.1 used the surrounds in a slightly more active manner, it didn’t do a lot to expand the 1991 edition’s horizons. Where the two most obviously differed connected to sound quality, as the 1991 2.0 track felt warmer and more commanding. The older mix boasted better low-end, a factor that added to the movie’s impact. As an example, examine scenes at the Baltimore mental hospital. In the 2.0 mix, these came with an ominous rumble that made the sequences more unnerving, whereas the 5.1 version severely tamed that factor. On its own, the 5.1 mix didn’t seem bad, but it clearly didn’t work as well as the 1991 2.0 track. The original audio definitely becomes the way to go. How did the 2018 Criterion release compare with the 2009 Blu-ray? Audio boasted an improvement because the 2018 disc offered the original 2.0 mix whereas the 2009 version came only with the inferior 5.1 track. While the former didn’t blow away the latter, I clearly preferred it. As for visuals, the Criterion Blu-ray came across as cleaner and a bit better defined, with more natural colors as well. Though the prior Blu-ray was pretty good on its own, the Criterion version seemed to reproduce the film in a more accurate manner. The Criterion set offers a mix of extras, and we open with an audio commentary recorded for a 1994 laserdisc. It features director Jonathan Demme, actors Jodie Foster and Anthony Hopkins, screenwriter Ted Tally, and FBI agent John Douglas. Douglas provides a grounding influence as he tells us the reality behind the situations. Although it's not the best Criterion commentary I've heard, this one is a very strong track that really adds to my appreciation of the film. 24 Deleted Scenes run a total of 37 minutes, 58 seconds. Don’t expect much in terms of truly unique footage, as most of these clips offer extensions of existing scenes or alternate versions of those sequences. Most of the remaining clips follow suit, as they expand the scenes we already know or offer variations. We do get a little fresh material, though, such as Crawford’s attempts to get information about Buffalo Bill from a doctor – a scene that deserved to be cut. Along the same lines, we find a thread in which Clarice becomes suspended and has to “go rogue” – with Crawford’s help – to pursue Bill in Ohio. Like the doctor scene, this one feels hokey and was a smart omission. As a big fan of the film, I’m happy to see these scenes. That said, I can’t claim any of them offer real gold. They’re fun to see but not especially memorable. Note that the final two segments don’t offer actual “deleted scenes”. Chapter 23 gives us a gag reel, while Chapter 24 presents an answering machine message Hopkins taped in character. While enjoyable, I don’t know why these were included as “deleted scenes”. film critic Maitland McDonagh. She chats for 17 minutes, 58 seconds and discusses serial killers and their depiction in popular culture, with some emphasis on Hannibal Lecter. McDonagh offers a nice collection of insights. trailer completes Disc One, and we head to the second platter. These we open with Jonathan Demme & Jodie Foster, a 2005 program that fills 52 minutes, 30 seconds with remarks from that pair. Both start with their involvement in Lambs and go through research and preparation, other actors, locations, sets and shoot details, character notes and working from Clarice’s point of view. We hear about the “direct camera approach”, performance development and the relationship between Foster and Hopkins, cinematography, and a few other challenges. For the last act, the piece covers score, structure, the film’s release and reception, and its legacy. The perspectives on display help make the piece worthwhile. It’s good to find Foster and Demme in these discussions, though it’s too bad they weren’t recorded together. Nonetheless, this is a consistently compelling documentary. Next comes a 2001 documentary called Inside the Labyrinth. This one-hour, six-minute, 25-second program features producer Ron Bozman, screenwriter Ted Tally, former Orion Pictures VP Mike Medavoy, production designer Kristi Zea, composer Howard Shore, set dresser Ken Turek, set decorator Karen O’Hara, art director Tim Galvin, special makeup effects Carl Fullerton and Neil Martz, costume designer Colleen Atwood, editor Craig McKay, production sound mixer Christopher Newman, moth wrangler Ray Mendez, re-recording mixer Tom Fleischman, sound designer Skip Lievsay, and actors Anthony Hopkins, Roger Corman, Diane Baker, Brooke Smith, Anthony Heald, and Ted Levine. In addition, we also get comments from film critic Amy Taubin and transgender activist Vicky Ortega. Remarks from actors Jodie Foster and Scott Glenn appear via 1991 interviews, while director Jonathan Demme remains totally absent. The failure of the last three folks to appear in the post-1991 material offers this program’s only disappointment, as while we hear from a slew of others, those three are awfully important omissions. However, I honestly barely missed them during this entertaining documentary. Very few stones get left unturned as the piece neatly cuts through all manners of the film’s production. It gives a fine overview of the various elements, and it even goes into the movie’s aftermath. Page to Screen runs 41 minutes, seven seconds and includes remarks from Foster, Tally, Medavoy, Glenn, Zea, Heald, book editor Richard Marek, NY Times book editor Christopher Lehmann-Haupt, producer Ed Saxon, former St. Martin’s Press editor-in-chief Tom McCormack, former FBI agent John Douglas, and actors Kasi Lemmons and Gene Hackman. “Screen” starts with a look at author Thomas Harris and then examines issues related to his work as well as some specifics of Lambs. From there we move to the movie. Its participants discuss why the project appealed to them and we get info about the tale’s path to the screen. Those pieces inspect how the producers brought Demme on board plus Tally’s script adaptation, casting, research and preparation, locations, sets, cinematography and visual design, the film’s shoot, its release and reception. Though “Labyrinth” encompasses a lot of information, “Page” manages to bring out a fair number of new details. I like the parts about Hackman’s initial interest in the project, and Foster’s dissection about why the movie needed a non-American actor to play Lecter proves insightful. I think it skims over the scriptwriting process too quickly. The title implies a stronger look at the printed page, whereas “Page” tries harder to become a general overview of the production. Nonetheless, it works well and fleshes out our knowledge of Lambs. For a look at the music, we go to the 16-minute Scoring the Silence. This presents notes from composer Howard Shore as he discusses challenges connected to the project, various choices he made and aspects of the score. He gives us a concise and insightful look at his work that proves illuminating. From 2008, we head to Understanding the Madness. In this 19-minute, 33-second featurette, we hear from FBI (retired) Supervisory Special Agent/Academy Group Senior VP Robert R. “Roy” Hazelwood, FBI (retired) Supervisory Special Agent/Academy Group VP Michael R. Napier, FBI (retired) Behavioral Science Unit Chief/Academy Group founder Roger L. Depue, FBI (retired) Supervisory Special Agent/Academy Group Executive VP R. Stephen Mardigan, FBI (retired) Behavioral Sceicne Deputy Unit Chief/Academy Group VP Richard L. Ault, Jr., and FBI (retired) Supervisory Special Agent/Academy Group Violent Crime Consultant James R. Fitzgerald. They talk about profiling of serial killers as well as aspects of Lambs. Fans of Lambs have heard a lot of this material in the past, but “Madness” nonetheless offers a good recap. It covers the subject matter in a compelling way and moves at a nice clip. Though a bit superficial, it’s worth a look. In addition, we get an eight-minute, seven-second Featurette that stems from the original release time frame of Lambs. This brief piece focuses on interview snippets from Hopkins, Douglas, Demme, Glenn, Foster and an unnamed FBI agent. Obviously the program’s brevity means that it can’t provide much depth, but it still offers a good experience. We learn some details absent from “Labyrinth”, mainly due to the extra perspectives. It’s a somewhat insubstantial piece, but I like it nonetheless. Disc Two concludes with a collection of Storyboards. This domain offers a running four-minute, 11-second montage of images created by artist Kalina Ivanov. It becomes a good glimpse of the movie’s planning stages. The package concludes with a 56-page booklet. It features the same essay from journalist Amy Taubin found in the old Criterion DVD release but it also adds an introduction from Jodie Foster, text from writer Thomas Harris, and 1991 interview with Jonathan Demme. Throw in credits and photos to result in a strong booklet.